I had lunch with a client, whom I respect and appreciate, but try to avoid discussing religion with him. He’s highly educated and Catholic; however his home parish is an ultra-left leaning South Minneapolis congregation, frequently in the lime-light (I’ll leave it unnamed). He believes his and my tenets are not a political left/right stance, but an entitlement of ideological viewpoints at our own election. For those who aren’t sure what that means, that particular parish is often subjected to whistle blowing, controversy and petitioning by a few ultra-conservative Catholic’s who want them excommunicated. Being a KC it’s important, though sometimes difficult for us to support ALL that is Catholic and ALL parish priests and pledge to leave ALL partisan politics at the doorstep for ALL KC sponsored events, including Lecturers Reports. As a daily Rosary contemplator, I’ve been meditating on my perceived differences with my friend and others. It’s possible he appears to attend, almost as a protest of traditional Catholic teachings that he believes he can affect change if he stays in our ranks. Empowering various causes via boycott seems to be the going fad these days with highly organized “wallet dot com orgs” shutting down stores, companies and sponsored events that differ with their philosophies. I believe my friend feels he earned the right to be Catholic, even though he disagrees with many of the interpretations handed down from the Vatican. It’s weird and seems a little secular to me, but if he’s attending Mass, receiving the Sacraments, hearing the Gospel, there’s always the chance for the Holy Spirit to play a role through the Pascal Mystery and for God’s Grace to touch his heart and soul. Who am I to judge him? Can he contemplate the same Gospel reading, hear the same sermon, pray the same Rosary meditations as I and yet reflect on them in a completely different way? Will he grow in his faith journey as I have over the course of a lifetime? Probably so. Interestingly enough, we each view one another as the one sheep the shepherd leaves the other one hundred to go find. In my 4th Degree KC travels, it’s sad to notice some other folks who appear to be “parish shopping” for sermons they agree with, which suggests some parishes are blending civic and gospel messages that inadvertently turn on or turn off folks and either attract or repel Sunday attendance’s. Without being consciously aware, a few folks are somewhat boycotting by floating from parish to parish, fishing for a favorable message. One could argue that they are seeking the Word of God with an open heart by attending Mass, but they could be missing the whole parish community bonus aspect. UNITY! Many modern-day Christians are connected to the internet. In this age of entitlement, a few people are more susceptible to outside influences, false teachings or feelings of empowerment via this so-called boycott mentality. Modern-day pastors, Bishops and even the Pope are forced to become more creative in marketing the message to their flocks through social media to increase attendance. At times, priests are literally walking on egg shells in hopes of not turning anyone off. From a business standpoint, our clergy still have to forecast financials and meet the day-to-day needs of the schools and parishes. If too many people float around, it’s difficult to manage all the numbers. Thank God our two priests are perfect and never say anything any of us disagree with at HNOJ. Gentlemen, think back and remember your First Degree Ceremony; it’s very important we always support all of our Catholic priests throughout the world with our thoughts, words and deeds. These special men didn’t get elected to be priests; they were called by the Holy Trinity and immersed themselves to the service of God’s daily works. I’m always mystified by the three beads at the beginning of the Rosary; what I was taught and have referred to in past writings as the Faith, Ho pe and Charity beads. This week’s Gospel message was one focused on HOPE, so I reflected and meditated on it to make it the topic of this article. Tis the season of HOPE. In fulfillment of scripture, God gave us the life, death and resurrection of Jesus and the HOPE of His second coming for our salvation. When baby Jesus was presented in the temple to the Holy Simeon and High Priestess, Anna, all their HOPE came to be true. There are parallels that I will stretch to prove a point or two, but I want to emphasize that Jesus didn’t need HOPE, He was and is HOPE for all of time and all of mankind. In general terms, HOPE is a very broad topic and takes on many forms. HOPE can fade. It can be tampered with and falsified. HOPE fluctuates like the stock market, for some. HOPE is emotional capital that we humans invest in certain beliefs, causes or perceived positive changes. It’s healthy to have HOPE, but can be unhealthy to have too much in some cases. Sports fans have abundant HOPE. This past election season demonstrated the biggest swing of HOPE I’ve ever witnessed. Strictly in my opinion, most people place too much HOPE in politicians. As KC’s we must always leave partisan politics at the door, which I intend to do here in sighting an example of two very different kinds of HOPE. For the most part, elections are always split in two with one side barely winning regardless of party. This year, the DFL had massive amounts of HOPE and momentum that would suggest their HOPE was going even higher with the surety of electing their next vision of HOPE. It was “money in the bank”, as they say. The GOP didn’t have much HOPE as the mainstream media and their own common sense directed them to “not get their HOPE’s up”. It seemed pretty obvious to all who would win the election. Both candidates were the least liked and least trusted ever to have run for public office, but the DFL had many more times the HOPE of the GOP. When the election results came in, the party of HOPE had a stock market crash, free-fall of emotional capital where all HOPE was dashed in the flash of time. The GOP had an unexpected, simultaneous nuclear explosion of HOPE, sky-rocket up past the falling DFL’s HOPE. Both sides were in complete disbelief and udder shock, some jumping for joy and others balled up in the fetal position, completely devastated. Never before has there ever been such a huge emotional swing of HOPE. The OMG’s were at a record level on all forms of social media. America was speechless as the two HOPE’s switched positions in a wild swing. Regardless of party, should we allow ourselves to be swayed to invest that much emotional capital into media driven representations that lead to elations or convulsions over electing mere humans? As we know so well, Catholics don’t always get a fair shake in the media, but that’s a whole different can of worms to open. Why are we so eager to give HOPE to well-intended, fallible humans, but have to work so hard to give TRUE HOPE to Jesus? No matter what side you had HOPE in, you might now realize that you are capable of having massive amounts of HOPE. At your own election, you choose to invest your HOPE in whatever you want. Why not the one TRUE HOPE, this glorious Christmas season? This upcoming election will be one of the most difficult ones in a long time. There is much confusion (by design) and many wonder what our obligation is as Catholics. Here is a u-tube link worth watching (19 min. long) to a full Sunday Homily given by a well known priest in Arizona. Many, if not all, of his homilies are on u-tube. He’s a no-nonsense, by the book homilist, not some far fetched whack-job. In our First Degree ceremony, we are to keep all partisan politics from our meetings. Should you watch this link, you’ll note that no specific party or candidate are mentioned by name. Our November meeting is actually on the 8th, or election night, so vote early, if you plan on attending. Fr. Steve came to our last council meeting on Tuesday, September 13th and presented a couple of issues weighing heavy on his mind. Across the entire country, but specific to our Archdiocese, attendance is down, at least 20%, which means Sunday collections are also significantly lower. In turn, all the various “worthy Catholic causes” are also feeling the crunch and stepping up efforts for all the area parishes to swing the collection plates a second time during Mass. The mathematics indicate that a large number of donors basically divide up the normal intended Sunday give between the two charities, resulting in both groups getting less. Many area Pastors are forced to disallow the second collections, in order to keep their own finances in check. Fr. Steve will speak to the parish about this soon. Chances are fairly high that it will be met with some resistance. Fr. Steve has elected to continue to support Ascension Parish and most of our HNOJ favorite charities, but needs to institute a few changes at HNOJ, some yet to be determined. He is creating a groundswell discipleship movement that will need the support of our KC Council and other “bellwether” leadership groups inside HNOJ, to help support Nate and Chris and other staff members, launch the efforts need to succeed. We have always had a great community at HNOJ. In the future, he may call on our council to assist in new ways, as he has always considered us “good disciples”. Our KC Council believes we may brainstorm the topic and help Father come up with ideas. Be sure to do your best to support all of his efforts. There’s nothing easy about being a priest. Because of the economy, the political environment and the historical and widely reported abuse in the Catholic Church, people are more emotional than normal. Trust levels are at an all-time low, across the board. The various topics are awkward to discuss and polarizing for priests and parishioners, especially the not-so-regular Mass attendee’s. The many openly public “armchair quarterbacks” love to bloviate opinions at work and social encounters, keeping wounds open and topics fresh. The mainstream media has never been an ally. As KC’s, one of our biggest duties is to support our parish priests with time, talent, treasure and prayer. We also need to pray for vocations. If you believe in history repeating itself, this isn’t the first time the Catholic Church has ever fallen out of favor with the masses. Every once in a while, I’ve engaged in a discussion about the 13 year old Pope that was put into power by corrupt families many centuries ago. At that time, much of Europe’s populace was illiterate, uneducated, poor and oppressed people. Also, during that time-frame, ordinary parish priests; i.e. St. Francis, St. Benedict, St. Ignatius, St. Dominic and many more, were touched by God or saintly intercedents and became infused with the Holy Spirit to create numerous, robust religious orders that educated and evangelized all of Europe. Most of them incorporated the Rosary with their teachings. The Catholic Church grew at an incredible rate, in spite of the dysfunction in Rome. It’s times like these, where God intervenes and inspires great deeds from ordinary people. Open your minds and hearts to prayer and meditation, attend mass, read the Bible and stay engaged in our wonderful HNOJ community. This, too, will pass. Last Sunday, the Gospel reading was the “Prodigal son” reading. I spent a brief time away from the Catholic Church, post college era and stumbled back into Holy Name of Jesus, one Sunday back in 1982, only to hear the three-part reading of the shepherd leaving the flock to find one sheep, the woman celebrating the finding of a small, lost silver piece and the “Prodigal son” parable. I sighed when the reader began, as I always thought this was foolishness and my least favorite reading. Not an ounce of common sense went into any part of those stories. I identified the most with the son, toiling in the fields and watching from afar, the massive reunion and celebration of the return of the outcast brother who blew his inheritance, only to return and receive even more. Fr. Arnold Weber was the homilist. He equated the woman finding a dime, at two a.m. and waking up all the neighbors to celebrate, to put it in modern time apples-to apples description. Stupid! Who would leave 99 sheep to be at the mercy of wolves and bears and thieves, only to go after one little lamb, knowing it would be easily replaced next breeding season, when all the ewes have their annual birthing events. Stupid! Stupid! As it turns out, God doesn’t use common sense and Fr. Arnie knocked it out of the park and delivered an awesome sermon. It’s now one of my favorite readings and I’m constantly reminded of how applicable it is to us Christians. I now sit on the Board of Directors of Trinity Sober Homes, LLC, a charitable organization that houses post alcohol/chemical treatment, men over age 40 in one of our three different group homes in St. Paul. Many of our men feel they are not welcome back in their church communities as a result of their past behavior. Founded by my namesake, Fr. Marty Fleming and former 1970’s head of the Army Chaplin Corps, he tells our fragile residents that the Catholic Church is not a museum for saints, but more of a hospital for sinners and so is Trinity Sober Homes. www.trinitysoberhomes.org So many folks show up at our door step and feel they are not worthy. That was one of the themes of a recent Gospel reading. Batten down the hatches, prepare ye the way, or as grampa used to say, “Katie, bar the door”. The political season is about to go into full swing. One of the hardest things about being a KC is the vow we take in our first degree, to leave all the partisan politics outside the door at our official KC functions. Social media and technology have made it possible to accelerate the various messages and venom spew. All the misinformation and disinformation is coming like a tsunami. The public has little chance of knowing the absolute truth. Grid your loins, protect yourself (from yourself) and know that volumes of smoke has been and will continue to be blown in your direction. In my short 63 years on earth, I have usually been my own worst enemy, by being swayed by the wrong people and messages they deliver. Not just politics, but various tout about investments, gossip, news items, and school subjects. There are a lot of self-appointed experts who are willing and able to share their opinions in effort to sway yours. Reading the daily Gospel, contemplation and meditation have been great ways to protect myself from myself. Notre Dame has a free daily Gospel reading, via email, with a reflection from an alum, teacher or priest, pertaining to the reading, a short prayer and a dedication to the “patron Saint of the day”. Anyone can sign up for it free of charge. The Unity and Fraternity degree’s give us a slight advantage over the less guided masses, in that we can choose to associate with spiritually active, like minded folks. Don’t shy away from attending the HNOJ Men’s breakfasts, the different HNOJ ministry opportunities to join or simply becoming more involved with the KC’s. It’s a great way to “gird your loins”. I’ve recently agreed to collaborate with two of my cousins to try to compile stories of our parents, grandparents and what little we can find on great grandparents, who emigrated from Germany. They ended up homesteading some acreage in the Otsego, MN area between Elk River and Albertville. Our grandfather homesteaded immediately north of the original family farm, once he was old enough to move out and apply for the grant. The bond that held them all together, during tough times, was their Catholicism and their German traditions. What I found fascinating was several of the same last names as are members of Holy Name, a parish with Germanic roots. It took me back to some of the German stories Fr. Arnie used to share with our parishioners. In discussing how our relatives homesteaded eighty acres in an era of pre-gasoline engines and pre-automated farm equipment, it pretty much meant hard work with horse teams, axes and shovels to remove trees to convert to tillable land. Depending on what species of tree, (oak, elm, poplar, pine), the wood served purpose for a wide variety of lumber uses for buildings and fences. Most residences were heated with wood and food was cooked on wood stoves. I recommend you all go out into your yards and contemplate what it would take to remove one tree from your yard with axes and shovels. Their “Cub Foods” store was Gods abundant nature. Trapping, hunting and fishing, was the main way to acquire meat and growing root vegetables served much of their produce needs. Learning to store and preserve enough food to feed twelve hungry mouths in one family can become a little overwhelming during normal Minnesota weather. Now couple it with a three year “dust bowl era”, a stock market crash, an Armistice Day blizzard and really make it interesting. Toil or suffering, struggling, and surviving back then was different than it is today, but handled similarly. The community banded together to take on big projects and traded labor or skills. They prayed. 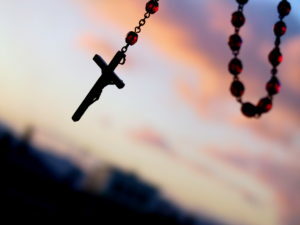 The Rosary was the go-to prayer that cured all and kept hope alive. Families and neighbors rallied together to assist, entertain and spiritually motivate one another. I honestly don’t think they knew they were poor. It was the only way they knew it was for their entire church community. Grampa hooked up the hay wagon or sleigh to the team of horses, every Sunday, to ride into town to attend Mass at St. Albert’s. On the way to town, all the straggling walkers and neighbors jumped on board and joined in on the rosary or singing and storytelling. Simple beginnings, simple times, simple lives. If you want to enter a different part of you logical mind, immerse yourself into your family history and chat with elders and credible historians. You may find answers and insights as to how you are the way you are. I often ask myself, how I came to be what I currently am. How’d I get here? It sneaks up on you and probably wasn’t what you thought it would be on graduation day. Gentlemen, as we celebrate the Lenten Season, make time to add the Rosary to your spiritual routine and simplify your lives. If you toil with sin, meditate on the Sorrowful Mysteries and open your heart and mind to God’s special way of making you say hmmmmm. An early January gospel reading was “the feeding of the 5000” story. I recommend you all read or meditate on it, after you read this. Though it pales in comparison, it must have been part of the inspiration of Fr. Jonathan Licari when he teed up the idea that HNOJ feed the Wednesday night religious education attendees, only to hear the sound of crickets in the meeting. The Apostles suggested to Jesus that they break up the crowd so they all can forage for meals and Jesus spurned the idea with instructions to the Apostles to find a way to feed them. He had a captive audience of 5000 and couldn’t imagine breaking them up and then spending many hours trying to regather them for his sermon. “…but Lord, it would take several years wages just to buy that much bread…” Jesus asked, “what do we have?” “Five loaves and two fish”, they replied. Can you imagine the expressions on their faces when he instructed them to divide it into two baskets and start feeding everyone? HNOJ had seen a major fall off of religious ed. attendance after Fr. Arnold Weber retired. There were lots of excuses the parishioners gave. It was more important to eat together as a family was the main one Fr. Jonathan heard. Sports, dance, choir, band/orchestra, prime-time TV shows, were among the many other reasons. The “light came on”, for Father Licari, that the parish could try to feed them. You should have heard the groans. There were over 800 mouths to feed. How do we feed that many? Committee members were at a loss as to how to tell Fr. Jonathan, in a nice way, that it was a horrible idea. Diane Pasquarelli (may she rest in peace) stood up and said it was a magnificent idea, as the committee stared like deer in the headlights and tried to send mental messages to sit down and be quiet. Diane was the kindest, most sincere, loving, giving person in the whole parish and nobody dared to make her feel foolish or challenge her, but they did ask her, “what do we have to feed them with?”. Without batting an eye, she replied, “we’ll get the KC’s to do it. Tom Silver, Steve Zylla, Greg Heggie, Jim Siefert, Dave Stumpf, all know their way around the kitchen and would be perfect for the job. All we have to do is ask them. They can serve pizza, hot dogs or simple meals. It’s no big deal”. The committee half-heartedly knew it would never work, but felt they all needed to be there to help pick up Diane’s feelings in the aftermath of the catastrophic failure. At the very next KC council meeting, in the new business portion of the meeting, the suggestion was made, approved and the rest is history. There was very little push-back, to everyone’s surprise. “Let’s try it for a while and if it fails we can do something else.” Our resourcefulness and networking skills with large corporations in various food related businesses, has led to some pretty fine dining at HNOJ. I can clearly state that, as a result of our involvement with the Wednesday Night Fine Dining, we have more than doubled our membership numbers at HNOJ Good Samaritan KC Council. To all our men and their families who dedicate so much time to that project, we all owe you tremendous gratitude for your efforts. We are only the secondary benefactors. The Religious Ed. attendance numbers dramatically increased and have held strong. There are parishioners who attend just for the social aspect of meeting other parishioners. As KC’s, our highest priority has to continue to be whatever our parish priests need us to be. That’s what made the KC’s, internationally, succeed since inception. Merry Christmas, everyone! One of my favorite passages, this time of year, is The Magnificat of Mary. I’d like you all to take the time to read it and meditate on it with first of The Joyful Mysteries. “Tis the season” for that mystery set on the daily rosary journey. Many of the daily gospels, these past few weeks have been parables of Jesus healing lame, blind, inflicted/afflicted, unclean, etc. people that he encounters, telling them it’s their faith that has healed them. It’s a message that gets repeated throughout the New Testament. We don’t have to be extremely physically bad off to ask to be healed or to accept Gods healing. The Magnificat is the Lectures report, this month. Somehow, being a tongue-in-cheek, smarmy overweight sixty three year old guy with a bad knee, whose eyesight is failing and recently diagnosed with asthma, along with an attitude towards current politics that, at the very least, is off-color and somewhat unclean, I identified with all those healing terms. It would be too easy for me to take this month’s Lecturers article in the wrong spiritual direction, but I couldn’t resist attempting to put a smile on your faces during this joyous time of year with some humorous self-flagellation. Instead, I’d like you all to rejoice in your own imperfections, knowing that His birth is what saves us all from ourselves as much as from our enemies. We’re all sinners that are supposed to strive to sin less, because it’s not possible to be sinless. It’s the guy looking back at you when you shave that has caused the majority of your set-backs, in life. The media is doing a great job of keeping enemies visible at all times, so continue to be vigilant, spiritually during this Christmas season. Jesus is the reason for the season. 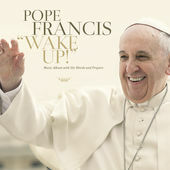 Rome Italy – November 27th, 2015 – The Holy See announced today the international release of Pope Francis new album “Wake Up!”. A 11-track pop-rock-infused album. This album is a compilation of “…Pope Francis delivering hymns and excerpts from his speeches in Italian, English, Spanish and Portuguese, paired with different types of music,” Rolling Stone reported. The album is also available for order on iTunes for $10.99 and you can purchase a cd for your car, stereo, or wherever else you wish to listen to our Pontifex. We have included below the iTunes page should you wish to preview the music.